This introductory tutorial explains how you can process image, video, audio, or text data by using deep learning models from the Model Asset Exchange in Node-RED flows. If you are not familiar with the Model Asset Exchange, this introductory article provides a good overview. This tutorial uses Node.js and Node-RED, so make sure that you have a current version installed. The tutorial was tested using Node.js version 10.13 and Node-RED version 0.19.5. It should take you approximately 30 minutes to complete this tutorial. Open a terminal window, start Node-RED node-red, and open the Node-RED editor by pointing your browser to the displayed URL, such as http://127.0.0.1:1880. From the ☰ menu, select Manage palette. In the Palette tab of the User Settings, select Install. Search for the node-red-contrib-browser-utils module and install it if you don’t already have it installed. 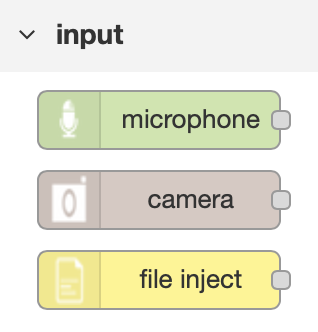 Verify that the camera and file inject nodes are listed in the input category. You’ll use these nodes later in this tutorial. The Model Asset Exchange nodes are published on npm. Search for the node-red-contrib-model-asset-exchange module and install it. Several nodes should be displayed in the Model Asset eXchange category. Each Model Asset Exchange node uses the endpoints of a deep learning microservice that you can run in a local environment or in the cloud. To keep this tutorial simple, you’ll associate your nodes with hosted demo microservice instances. To learn how to run your own microservice instance in a local environment, refer to this tutorial. 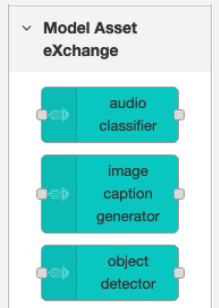 For illustrative purposes, you’ll be using the image caption generator node, which analyzes an image and generates a caption. If you prefer, you can follow along using a different node. The steps and concepts covered in this tutorial apply to all nodes. Drag the image caption generator node onto the workspace and review the displayed information. The node has one input and one output (the microservice response). Double-click the node to edit it. Two node properties are listed: service and method. 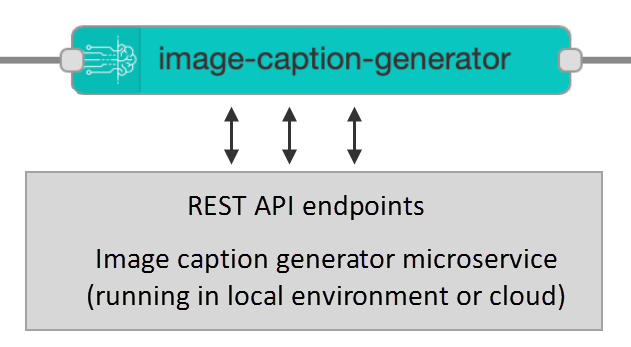 Edit the service node property to associate the node with an instance of the image caption generator microservice. By default, host is pre-populated with the URL of a hosted demo instance of this microservice, which you can use to explore its capabilities. Click Add to associate this demo instance with your node. Never use hosted demo microservice instances for production workloads. To use your own (local or cloud) microservice instance, enter its URL (for example, http://127.0.0.1:5000 if you are running the service on your local machine using the pre-built Docker container from Docker Hub). The Model Asset Exchange microservices expose multiple endpoints, which are listed under the method property. By default, the predict method is selected, which analyzes the node’s input. From the drop-down list, select metadata to retrieve information about the microservice. Close the node’s properties window. Drag an inject input node onto the workspace and connect its output to the input of the image caption generator node. Drag a debug output node onto the workspace and connect its input to the output of the image caption generator node. Your completed flow should look like the following image. From the ☰ menu, select View > Debug messages to open the debug output view. You’ve just confirmed that the node can connect to the specified service. Next, you’ll modify the flow to generate an image caption. The image caption generator’s predict method analyzes the provided input image and generates a brief description of the image’s content. Double-click the image caption generator node to edit its properties. Change the selected method from metadata to predict. Replace the inject node with the file inject node (or the camera node – only supported in Chrome or Firefox) and connect its output to the image caption generator node. Click the file inject (or camera) node’s button to select an image (or take a picture) and inspect the debug output, which should contain a caption describing the image. a man sitting on a bench with a dog . You can access the entire microservice JSON response through the message object. Open the debug node’s properties and change the output to complete msg object. Redeploy the flow and rerun it. Inspect the output. The message details contain a predictions array that contains generated captions. 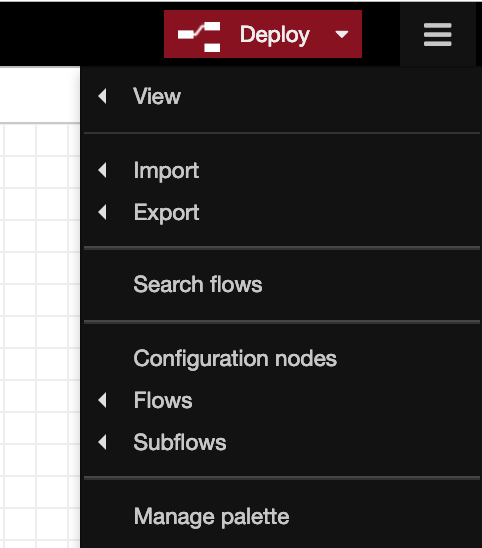 The node-red-contrib-model-asset-exchange module includes a couple getting started flows that you can import into your workspace. From the ☰ menu, select Import > Examples > model asset-exchange > getting started. Select one of the flows to import it into your workspace. Review the pre-configured flow, deploy, and run it. 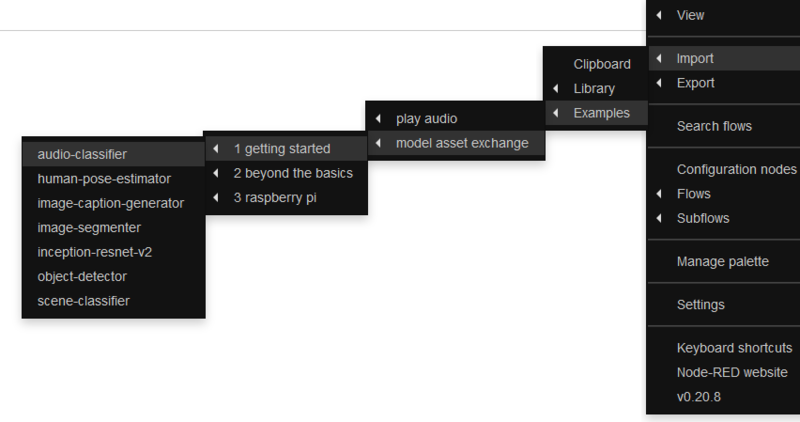 Now that you have a basic understanding of how to use the Model Asset Exchange nodes, feel free to try out some of the more complex Raspberry Pi flows that we’ve published in the Node-RED library. Deploy deep learning models as a microservice and consume them in your applications or services.